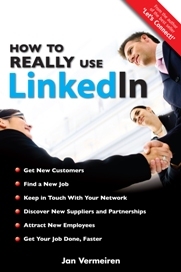 There is this nifty little book called ‘How to REALLY use LinkedIn’ by Jan Vermeiren that tells you all of the secrets to making money, and building up your network, with the social networking site/tool LinkedIn. And I must say that it works so well that I’ve spent the last 6 days catching up on the 600+ emails I received after doing what Jan said. And I just did the first thing – he’s got a series of steps to really dig in and do a whole marketing campaign. Jan tells you what to say, how to say it, and, most importantly, how to manage the technology to get out large mailings to invite folks into your network. He’s got these nifty tips and work-arounds that allow users to do great stuff to find the right people to connect with, use their connections, and develop a whole marketing strategy using social networking. The book is simple to use, easy to read, and fun. And it really works. As a result of my now extended network (last week I had 146 connections, and now I have almost 1000 and it’s still growing), I got a potential investor, two speaking engagements, 6 possible new partners, several potential clients, and unfortunate correspondence from and old lover or two. If you have interest in social networking, and you are willing to put in some time to gather and connect with colleagues to share business ideas and grow together, get the book. And Jan is a truly lovely person – willing to help and serve, and answer questions. He can help you grow your business blending the new technology with the old model of just connecting with people.